Fig. 4. In vivo mutagenesis assay, using pUR288. (A) Plasmid-derived shuttle vector pUR288. CRP, cAMP receptor protein; ori, origin of replication; lacZ, gene encoding /¡-Gal; Hindlll, restriction site used to release the plasmid from genomic DNA. (B) Principle of the assay: LacZ- mutants are positively selected on P-Gal plates. See text for additional details. 12 J. 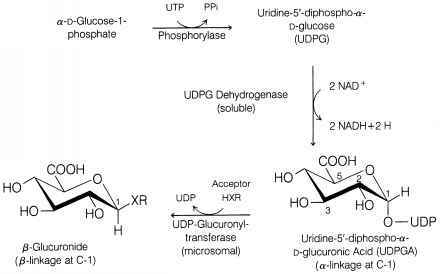 A. Gossen, A. C. Molijn, G. R. Douglas, and J. Vijg, Nucleic Acids Res. 20, 3254 (1992). and sections on troubleshooting are available.13-15 More specialized articles on the detection of so-called color mutants,16 the nature of background mutations,17 and sources of assay variability18 have also been published. In addition, a commercial kit-based version of the assay—together with technical support, a step-by-step protocol, and accessory services, such as mutational analysis by DNA sequencing and two-dimensional electrophoresis—is being offered by Leven (www.leveninc.com). Our overall experience with the assay is positive, but attention must be paid to preparing DNA of high quality [even small amounts of impurities (proteins, salts, organic solvents) can sometimes decrease the rescue efficiency of the shuttle vector] and avoiding contamination with unrelated plasmids that are lacZT, lacO+, and ampicillin resistant. Plasmids of this nature (e.g., derivatives of pBluescript) are in widespread use in many laboratories, and they can easily show up as false "pUR288 mutants" after finding their way into reagents or laboratory space where the mutagenesis assay is performed. 13 J. A. Gossen, W. J. de Leeuw, and J. Vijg, Mutat Res. 307, 451 (1994). 14 J. Vijg, M. E. Dolle, H. J. Martus, and M. E. Boerrigter, Mech. Ageing Dev. 99, 257 (1997). 15 J. Vijg and G. R. Douglas, in "Technologies for Detection of DNA Damage and Mutations" (G. P. Pfeiffer, ed. ), p. 391. Plenum, New York, 1996. 16 M. E. Boerrigter, Environ. Mol. Mutagen. 32, 148 (1998). 17 M. E. Dolle, H. J. Martus, M. Novak, N. J. van Orsouw, and J. Vijg, Mutagenesis 14, 287 (1999). 18 M. E. Boerrigter and J. Vijg, Environ. Mol. Mutagen. 29, 221 (1997). 19 S. H. Jackson, J. I. Gallin, and S. M. Holland, J. Exp. Med. 182, 751 (1995). FIG. 5. Phagocyte-mediated mutagenesis in neighboring B cells. (A) Scheme of the coincubation of pUR288~ effectors of mutagenesis, peritoneal exudate cells (PECs), with pUR288+ target cells of mutagenesis, splenic B lymphoblasts. 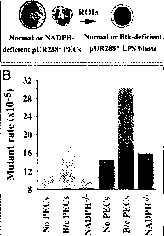 (B) Mutant frequencies were determined in normal B/c lym-phoblasts (triplet of light gray columns to the left) and Btk-deficient B/c lymphoblasts (triplet of dark gray columns to the right) in the absence of PECs (left columns), the presence of normal B/c PECs (middle columns), and the presence of B6 p47phox~l~ PECs deficient in NADPH oxidase (right columns). A total of 4-25 x 105 colonies was screened in the different experimental groups. Bruton's tyrosine kinase, an important signaling molecule in B cells that has been shown to play a major role in B/c PCTG.20 Figure 5B shows that normal B/c PECs induced elevations in mutant rates in both normal and xid B cells. In contrast, NADPH-deficient B6 PECs (p41ph"x '' ') were unable to mutagenize neighboring B cells. Furthermore, although the overall response pattern was highly similar in normal and xid B cells, the latter seemed to be more susceptible to phagocyte-induced mutagenesis. Taken together, the results demonstrate that the pUR288 assay is useful for both assessing cell-mediated oxidative mutagenesis in B cells and studying the effect of genetic mutations on this phenotype. 20 M. Potter, J. S. Wax, C. T. Hansen, and J. J. Kenny, Int. Immunol. 11, 1059 (1999). 21 L. Cosentino and J. A. Heddle, Mutagenesis 14, 113 (1999). 22 R. A. Mittelstaedt, M. G. Manjanatha, S. D. Shelton, L. E. Lyn-Cook, J. B. Chen, A. Aidoo, D. A. Casciano, and R. H. Heflich, Environ. Mol. Mutagen. 31, 149 (1998). 23 H. Okonogi, T. Ushijima, X. B. Zhang, J. A. Heddle, T. Suzuki, T. Sofuni, J. S. Felton, J. D. Tucker, T. Sugimura, and M. Nagao, Carcinogenesis 18, 745 (1997). 24 S. Nakamura, H. Ikehata, J. Komura, Y. Hosoi, H. Inoue, Y. Gondo, K. Yamamoto, Y. Ichimasa, and T. Ono, Int. J. Radiat. Biol. 76, 431 (2001). 25 J. L. Jakubczak, G. Merlino, J. E. French, W. i. Muller, B. Paul, S. Adhya, and S. Garges, Proc. Natl. Acad. Sci. U.S.A. 93, 9073 (1996). 26 S. E. Andrew, L. Hsiao, K. Milhausen, and F. R. Jirik, Mutat. Res. 427, 89 (1999). 27 D. M. Zimmer, P. R. Harbach, W. B. Mattes, and C. S. Aaron, Environ. Mol. Mutagen. 33, 249 (1999).